I’ve been to 80 games at 54 English soccer stadiums and toured about a dozen of them, and I think my favorite is Villa Park, home of Aston Villa Football Club. 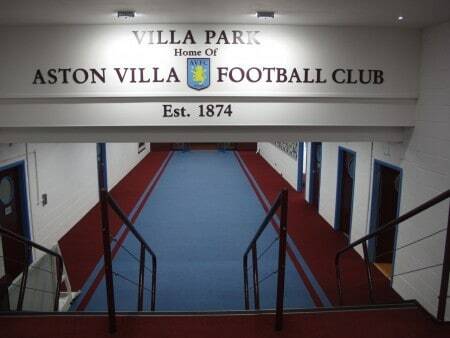 The players’ tunnel at Villa Park. That’s even more true now that I’ve toured it. It’s big, it’s old, and it’s classy. I like their colors. I like their tour guides. I like the occasional stained glass. I like their tradition of having Americans play for them, including their current goalkeeper. All in all, I basically can’t get enough of the place, even though when I toured there in December 2015 they were about as locked-in to get relegated as a team could be. I think they had one win the whole first half of the season! I guess that just means tickets will be easier to come by next year, even if the crowds will be smaller and the opponents less interesting. Check out these Frequently Asked Questions to help you get started planning your soccer adventure. Or take advantage of my Consulting services! Here’s a video from the tour, walking out into the rain-soaked stadium. The lights on the pitch are basically grow lights, by the way. Impressive, but they sure mess with a camera’s settings!